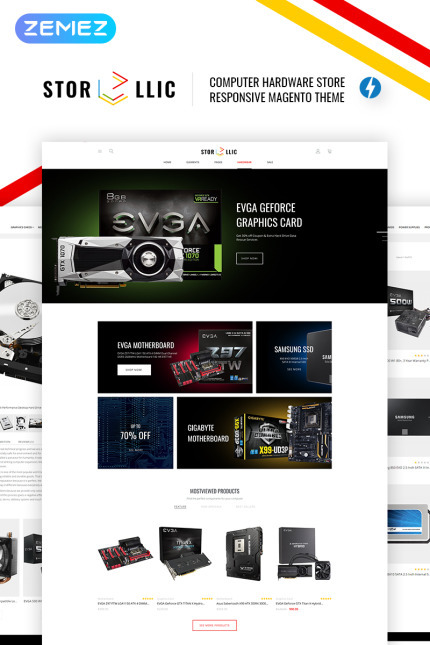 This Magento 2 theme has minimal and clean design which suits best for Computer Hardware or Electronics Store, the theme is compatible with Magento 2 and fully responsive, so that it looks nicely on any device from desktop to mobile. The code integrated into the theme meets all SEO requirements, as well. Launch your store within several days and start getting your orders. The theme offers you all essential modules, tools and widgets to create and customize any page element, such as banners, sliders, menu or products. Moreover, the StorLlic theme guarantees not only a good design but also a great performance.